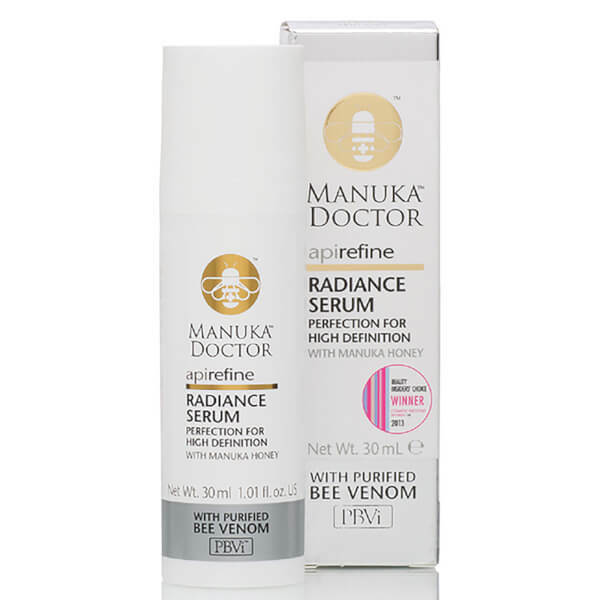 Rediscover youthful radiance with Manuka Doctor's ApiRefine Radiance Serum, an anti-ageing formula infused with Manuka Honey to leave skin hydrated, luminous and younger-looking. Clinically proven to help ease the appearance of wrinkles, the skin perfecting serum expertly brightens and evens your skin tone whilst performing a firming and plumping effect thanks to Purified Bee Venom (PBV™) and a special ingredient derived from Organic Cactus. Utilising light diffusing particles, the serum illuminates your features to improve the appearance of skin and leaves your complexion hydrated, radiant and perfected. Simply smooth the silky formula on clean skin using light massaging and upwards sweeping movements. 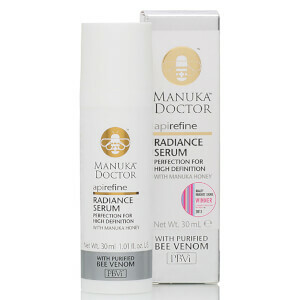 Allow skin to absorb before applying moisturiser. Aqua (Water), Cyclopentasiloxane, Polysilicone11, Dimethicone, Glycerin, Sodium Acrylate/Sodium Acryloyldimethyl Taurate Copolymer, Mel (Honey), Parfum Fragrance), Mica, Phenoxyethanol, Isohexadecane, Butylene Glycol, Acrylates Copolymer, Polysorbate 80, Disodium EDTA, Ethylhexylglycerin, Sorbitan Oleate, Opunia Ficus indica Stem Extract, VP/Polycarbamyl Polyglycol Ester, Hydrolysed Sesame Protein PG Propyl Methylsilanediol, Caprylyl Glycol, 1,2 Hexanediol, Bee Venom, Acetyl Octapeptide 3, Butylphenyl Methylpropional, Linalool, AlphaIsomethyl Ionone, Limonene, Hydroxyisohexyl 3 Cyclohexene Carboxaldehyde, CI 77891 (Titanium Dioxide).